Lauren is considerably more comfortable when we turn the water off when we’re out of town – especially longer trips like our upcoming week at Kirkwood. 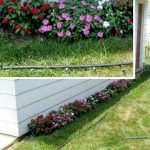 Watering – including the very nice impatiens by the garage – via the normal system is not workable with the water off, at least until the Water Cop valve is in place, controllable and tested. We’re not there for 2018. 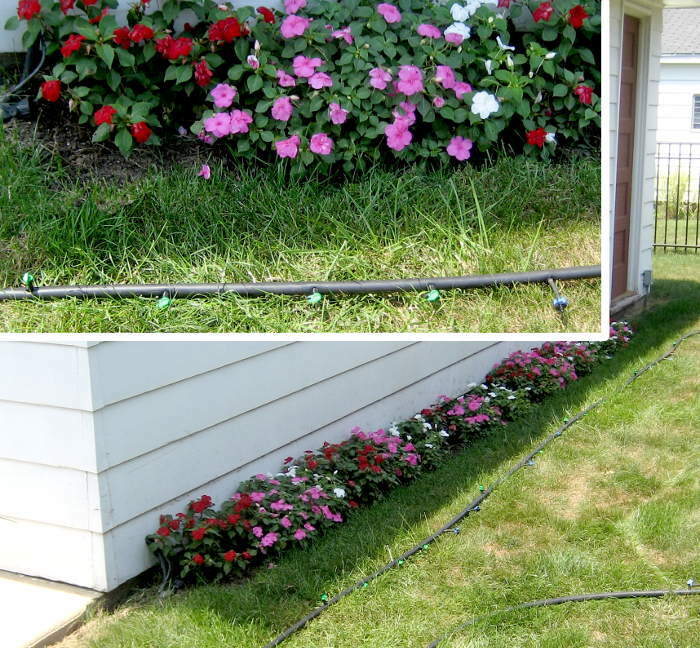 But I really like the impatiens, and they’re not likely to survive a week with no water. One possibility we considered is water absorbing gels/crystals. AquaSmart claims 8x by weight water retention. 4 lbs is $25, but hard to get in time. That much would hold 30 lbs of water – around 4 gallons. A small help, but only the first few days. Not great. 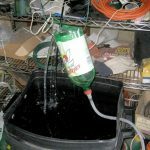 Another possibility is using an old fountain pump I have around and some kind of soaker or drip hose in the flower bed. 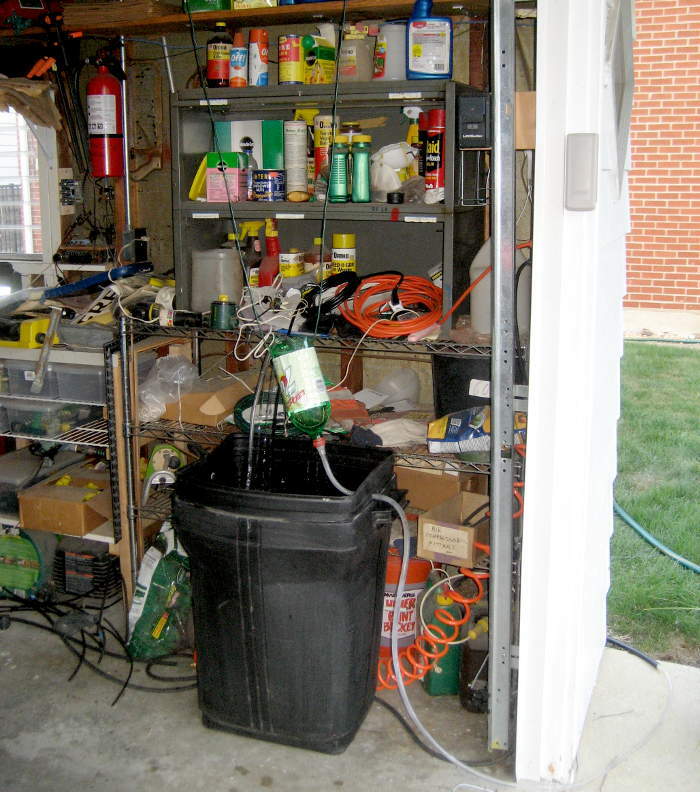 A big container of water in the garage might supply the system. Let’s see if that will work. 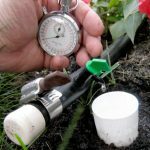 How much water do I need to put down? A quick test showed the current hose outside with a breaker nozzle delivers a gallon in ~7 sec, or 8.5GPM. A nice day’s watering takes about 29 sec with that hose/nozzle. That means I’d like to put around 4 gallons out per day. For the ~5 days we’ll be gone, that’s 20 gallons – quite a doable garbage can full. I tried the soaker hose that usually supplies that bed, but with the low pressure I could get it didn’t work well. 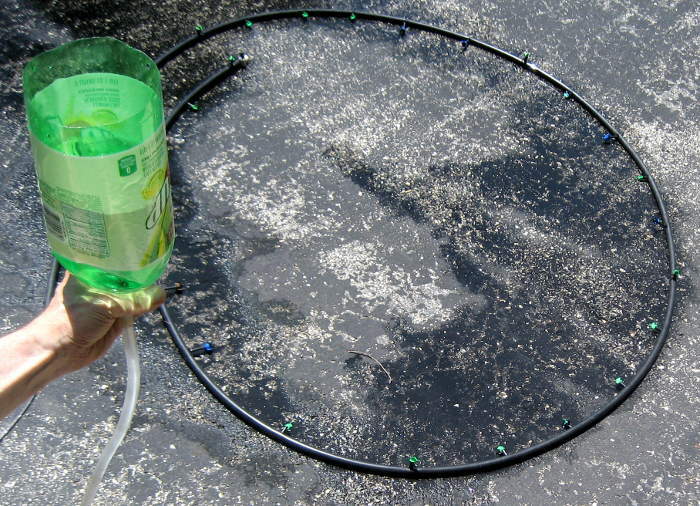 I have a bunch of drip watering stuff, and it’s easy to assemble. Would that work? Since it wouldn’t be running house water pressure, the 4 GPH rating of the drippers I had was suspect. After various tests, it looked like it would work. 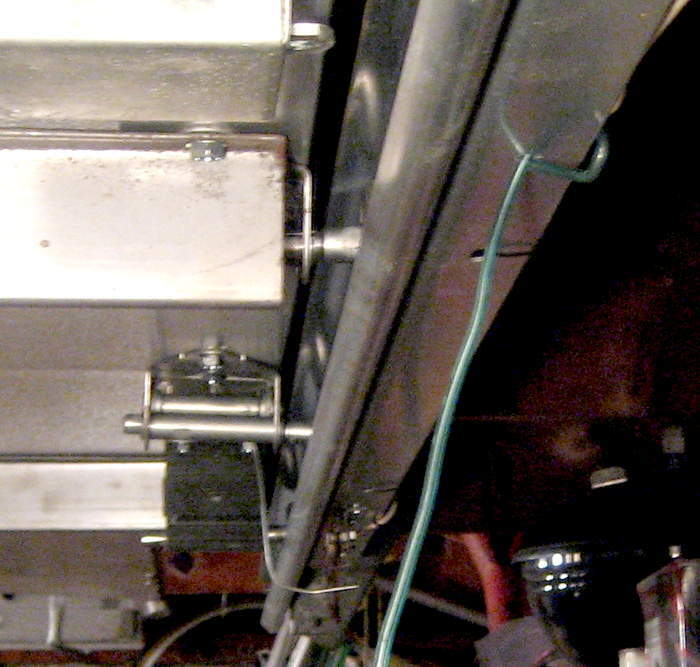 Too slow isn’t really a problem – it can run it as long as it needs to, as long as I know the flow rate. 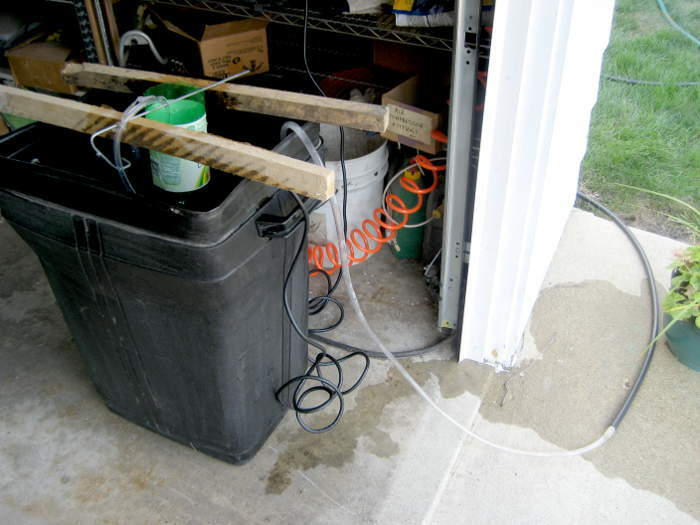 A 20 gal garbage can with the pump filling say a 2 liter bottle that feeds the drippers and overflows back into the can for 8 minutes a day might just work. Pulled the old Saylor drip irrigation line out completely, scored lots of blue (2 GPH) and maybe 1 aqua (4 GPH), drippers, plus lots of hose. Laid out and cut off a chunk just right for the flower bed. 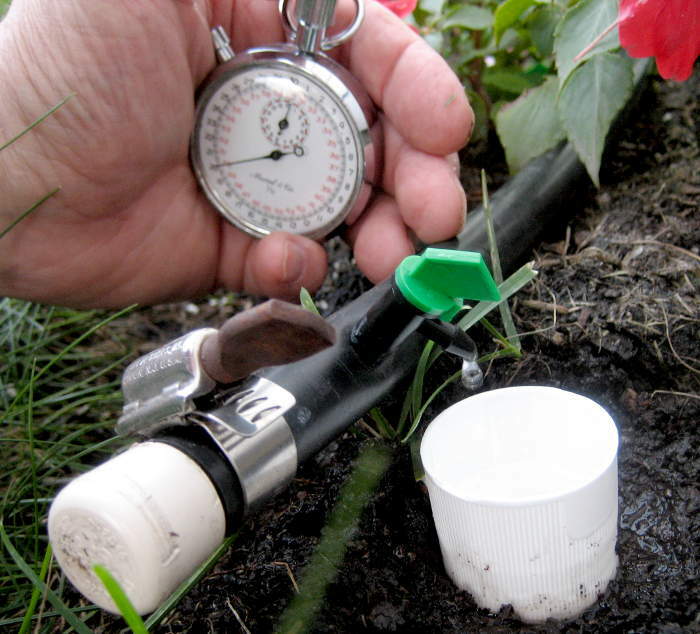 I had about 23 4 GPH drippers, and the hose segment for the flower bed was 192″. Laid out and punched in all the drippers at a little under 9″ apart. A little farther apart than I’d like, but should work. Test time. 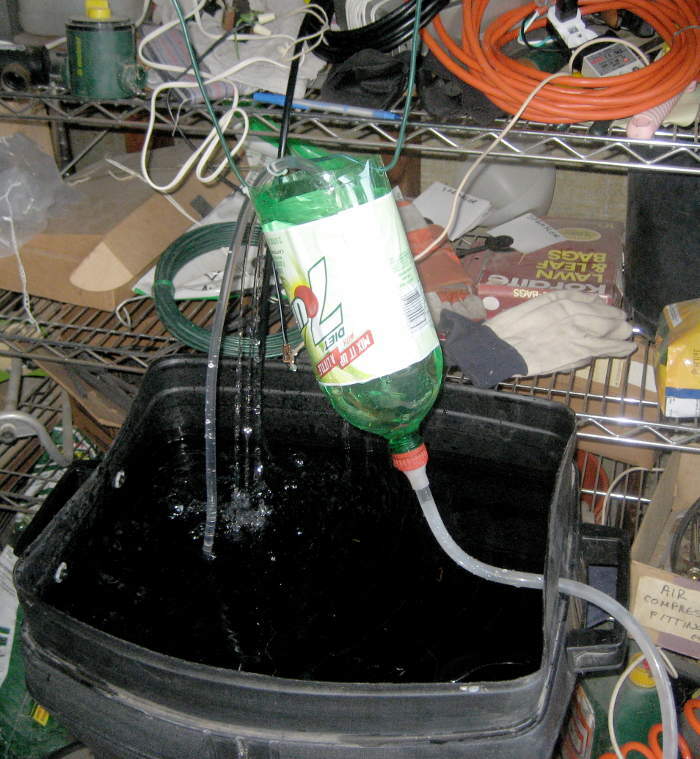 A 2 liter pop bottle ‘tank’ at maybe 36″ head drained in about a minute. That’s about half a gallon/minute, about as expected. Seems workable. One option to control the pump would be a timer. 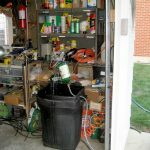 But there’s already a valve in the garage that controls water to the window box and a pot, run by 24VAC from a node on the main home automation system. Since that isn’t useful with the water turned off, I should be able to use that line to control the (120VAC) pump. I have an SSR wired up to an extension cord that should easily handle the pump. All I need is low voltage DC to run the SSR’s LED input. I should be able to get that from 24VAC with a minimalist power supply. But how much current does it need to provide? 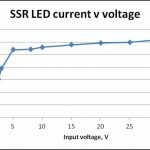 I figured the SSR input – marked 3-32VDC – would be an IR LED and a resistor, but some quick measurements proved otherwise: Something in there is implementing a more or less constant current load of ~12mA. 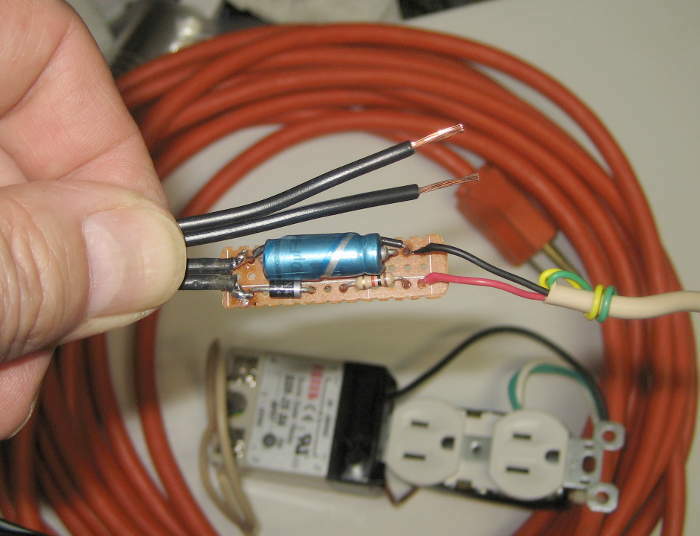 OK – that just means I need to compute the filter cap value in my half-wave supply for constant current rather than a resistive load. 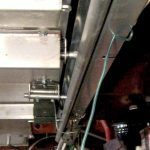 Since the 24VAC sprinkler control transformer puts out more like 30V with no load, the supply will peak around 42V, which is out of spec for the SSR. 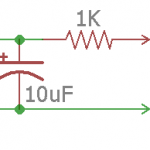 At 12mA, a 1K series resistor should drop about 12V, leaving the peak in spec at ~30V. It increases the power supply parts count by 33%, but Oh Well. 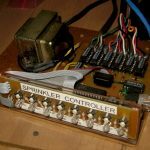 Since the SSR is guaranteed to conduct down to 3VDC control input, I could afford a lot of ripple (to keep the filter cap small). 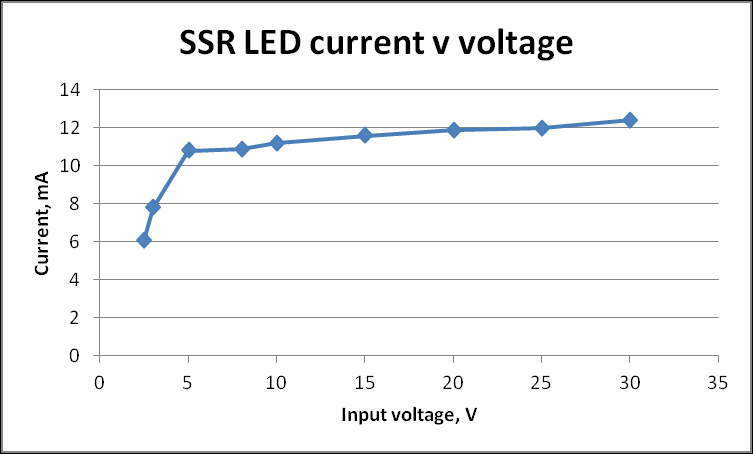 Sorry for no scope pic, but the observed voltage across the SSR input looked about like this, with the peak at 29V and the bottom of the ripple at 4V. Arguably ugly, but completely in spec. Here’s the implementation. Got it all hooked up for first try (with several days yet before we left!). Instead of hooking up the SSR control supply to the wiring for the garage valve, I brought a 24V transformer out and plugged it into the conveniently switched outlet for the air compressor (and unplugged the compressor). 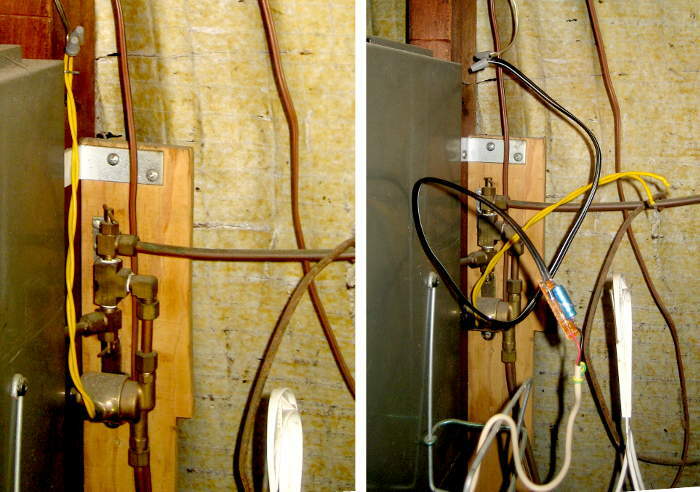 I turned the pump on and off so many times during testing that that wall switch was way more valuable than I ever dreamed when I first hooked up to it. The pump frequently only started when manually shaken/twisted. That’s fatal. 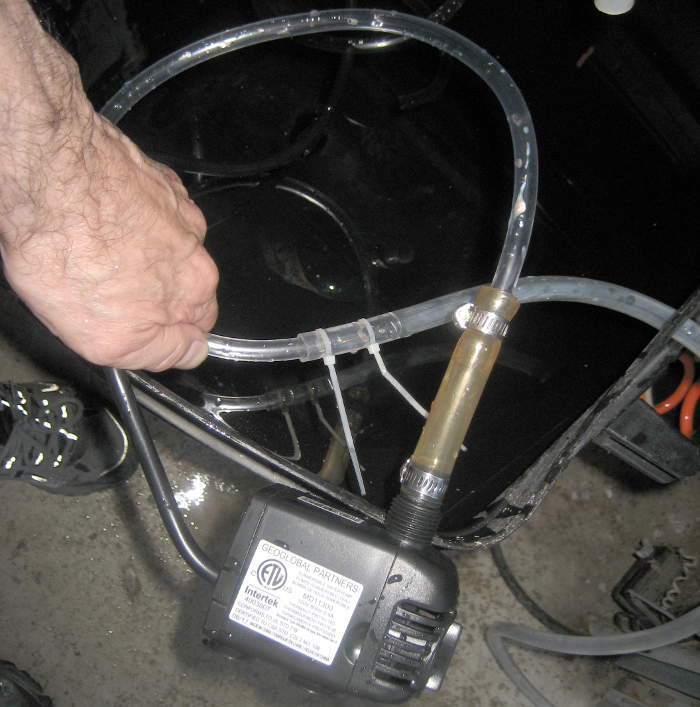 When the pump did run, sometimes it could barely lift water into the tank. And I wanted the tank a foot higher! The line to the drippers never fully filled. 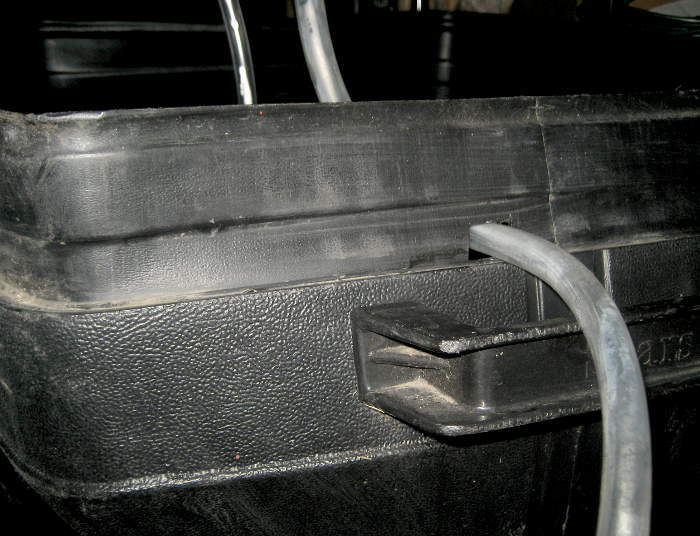 The tank was in the garbage can, and the output had to go uphill to get out. It did, but lots of air remained in the line. Three different failures for a system that needs to run unattended is pretty much a guarantee of ultimate failure. Bummer. An interesting point of view change slowly took place. 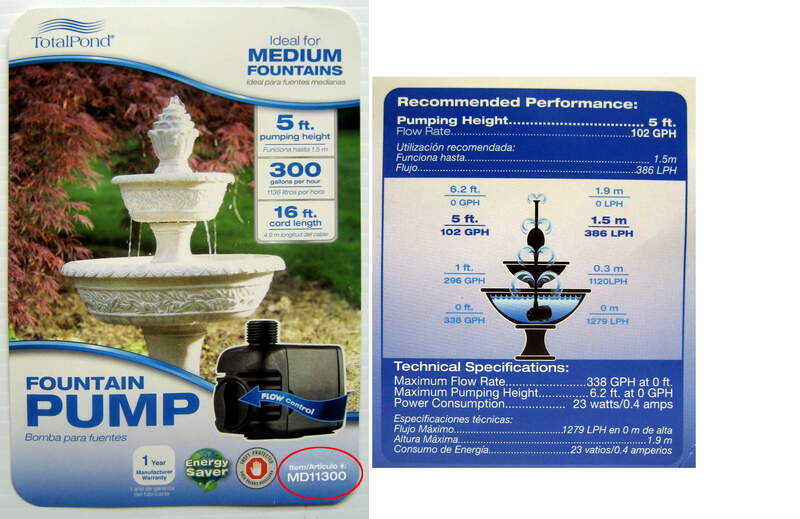 I grudgingly looked at fountain pumps at Home Depot. There were lots to choose from, up to ones claiming 7′ lift. While this wasn’t formally a junkbox project, I had really planned to use the pump I had. But that wasn’t a requirement. If I had to go buy a pump, I guess I could do that. Of course a new pump would start every time. If suitably spec’d, I could get whatever lift I needed. With enough lift, I could raise the tank above the garbage can, probably allowing the line to the drippers to fill solid with water, taking full advantage of the head provided by the tank. I got the pump (TotalPond MD11300). 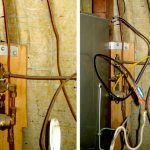 Says it’ll do 100 GPH at 5′. That’s a little under 2 GPM, and the tank/line/drippers deliver ~0.5 GPM. And the output fitting was the same size as the old pump to boot! We’re under way. With confidence the pump can get water up there, I hung the tank from the garage door track support, which put it right over the garbage can. I had to cut a longer piece of the 1/4″ ID vinyl tube to get water up to the tank, but that was fine. I tied the source tube to the tank hanger with zip ties. Looks good. 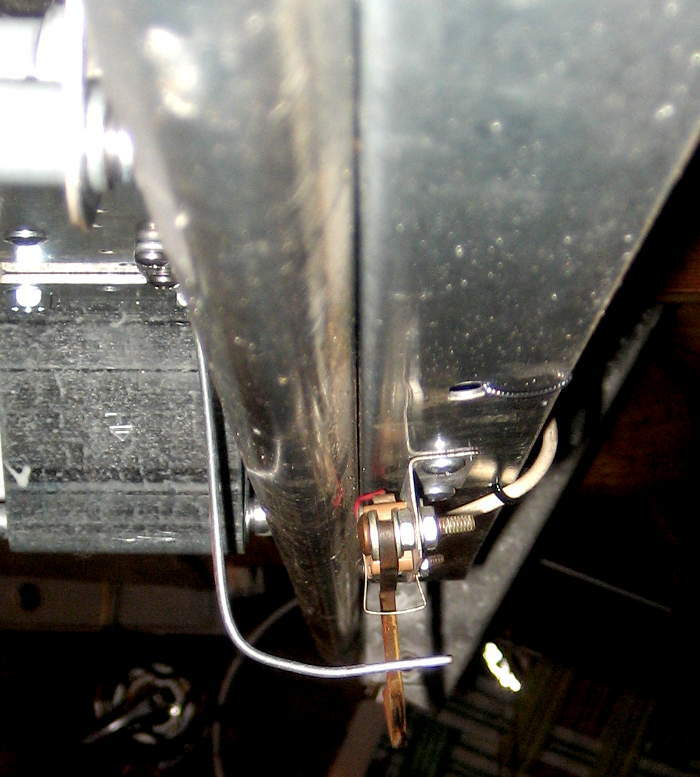 Now that the tank was completely above the garbage can the output line could avoid the down-and-back-up trap that probably contributed to air in the line. 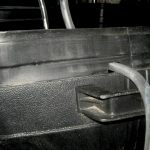 A hole cut in the side of the garbage can should hold the output line nicely, while doing little structural or functional damage. 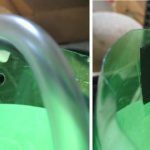 To gracefully manage the intentional overflow of the tank, I punched a couple of 1/4″ holes near the top of the tank with a paper punch. 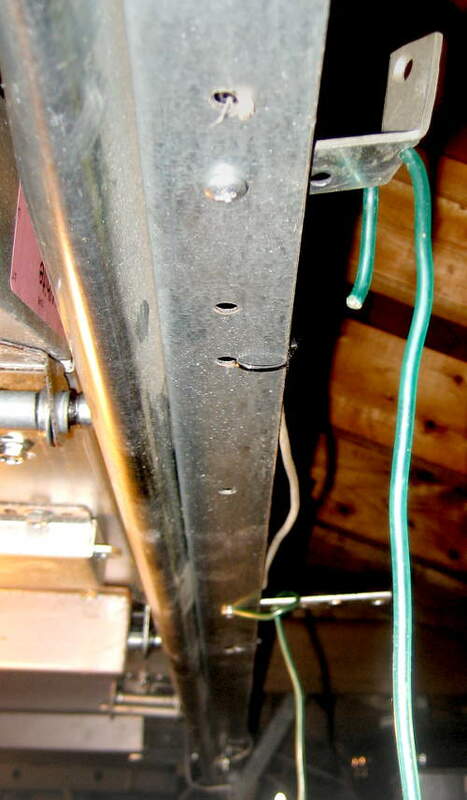 Hanging the tank at a slight angle ensures the overflow goes thru those holes. Here’s the final layout, with overflow in progress. I ran a few pump-on/fill/pump-off/drain cycles, and everything looked about perfect. But then it occurred to me: Why not just connect the pump directly to the output line? The extra back pressure would just seem to the pump like it had to pump higher, which is completely in spec. And the whole thing would be simpler and maybe a little more reliable. I felt a little dumb about the time spent on the tank, but this is better, so let’s do it! Unfortunately, the new configuration takes away my time-to-drain-the-2-liter-tank flow measurement, and the flow is probably different. 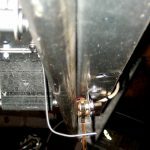 How do I get a flow rate so I can set run time appropriately? The output of each dripper should be about proportional to the total flow, so before I tore the old setup down, I measured the time to fill a small cup from a convenient dripper: 37 seconds. That’s with my 2 liter/minute setup. The water feed tubing fit perfectly inside the output tube. I replaced the water feed tube with a shorter one, added a couple of zip ties so make sure it wouldn’t separate, and put the pump back in the water. Then I measured the time to fill that same cup: 32 seconds. Not a big difference, but decreasing my run time by that 15% should account for it. Great! I ran a couple of cycles, admiring the new, simpler setup. But then I noticed: With the pump off, there was still water flowing. The original design considerations came back to me in a flash (splash? ): In addition to providing a constant head, the tank was there to prevent what just I was seeing: a continuous siphon thru the unpowered pump. The tank designed around that, but then I forgot about it. So much for my simplifying “improvement”! The good news was that I hadn’t quite gotten around to tearing down the suspended tank yet. So I undid all I’d just done, and went back to the tankful layout. Tested, works. With everything back together and my inappropriate simplifications undone and the embarassment receding into the past, it was ready for the final step: connection to the home automation system. 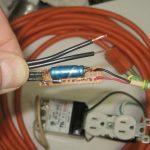 I disconnected the wire nuts binding the HA-controlled 24VAC from the house to the garage valve, and moved the SSR control power supply from its local 24V transformer to the HA-controlled line. I logged into the Pogo from a tablet in the garage and told it to turn on the garage valve for 10 seconds. The SSR LED lit and the pump came on. Success! Actually remembered to add a cron job to fire it up every day. Must measure water depth to see if it works in the morning. 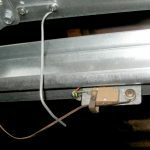 The problem was clear at first glance: The wire finger attached to the door that operates the switches passes right thru where the tank support wires hung, and had gotten bent. Rats. I think I even saw that coming, but promptly forgot about it. As a crude but fully functional fix, I bolted little scrap metal brackets into the holes in the garage door track support angle that the tank support wires had gone thru originally. That let me move the support wires an inch or two, and out of the way of the moving finger. A quick rebend of the finger and it’s all back in business. Update next morning: The water level in the garbage can was 3.25″ lower than last night (and the garage door button LEDs still work). A rough measurement of the can indicated a cross sectional area of 15 x 18 = 270 in². At 231 in³/gal, that’s about 1.2 gal/in depth change, indicating about 3.9 gal delivered from the 9 min the Pogo was told to turn the “garage” on for. 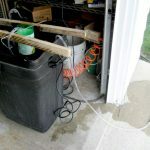 The “time to drain” flow calculation of ~0.5 gal/min predicted ~4.5 gal. Less a little evaporation, sure, but I’d call that a total success! I’ll post the results after the target trip. Tuning update same day: I’m generally delighted with the system (and the fact that it was done a couple of days rather than hours or minutes before we had to leave), but that extra time gives me the luxury of a little extra tweaking. 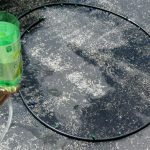 I was pleased to gentrify the overflow path with the punched holes peeing neatly back into the garbage can rather than dribbling water down the outside of the tank, down the output tube, thru the hole in the side of the garbage can and onto the floor. Yeah, it’s just the concrete garage floor, and the water would drain straight outside, but this is nicer. Unfortunately, the 3rd hole was too much, and water from it often just dribbled down the outside of the tank. 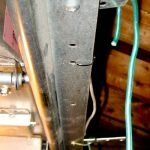 How should I patch that 3rd hole? First thought was hot melt smushed into the hole by thumb and forefinger protected by bandages of thin plastic or something. Might have worked – should try it some time. The second idea won as “at least good enough”. Pieces of the best tape I could think of on both sides, stuck together thru the hole. I chose Gorilla tape, mostly because I had some. It only has to last 5 days of being wet for 10 minutes a day. I’m predicting success; update to follow. Update 8/6/18: We’ve been back a couple of days now, and the watering system seemed to have worked as designed. The flowers were fine, and water level in the garbage can was fairly low (but not measured). It’s run 2 additional days, and the pump is probably sucking air by now. Guess I should shut off the cron job (or refill the garbage can). Oh, and the tape covering one of the overflow holes is still firmly in place. It’s busy out, but I better decide what to do about watering going forward. Anyway, the system counts as a complete success. 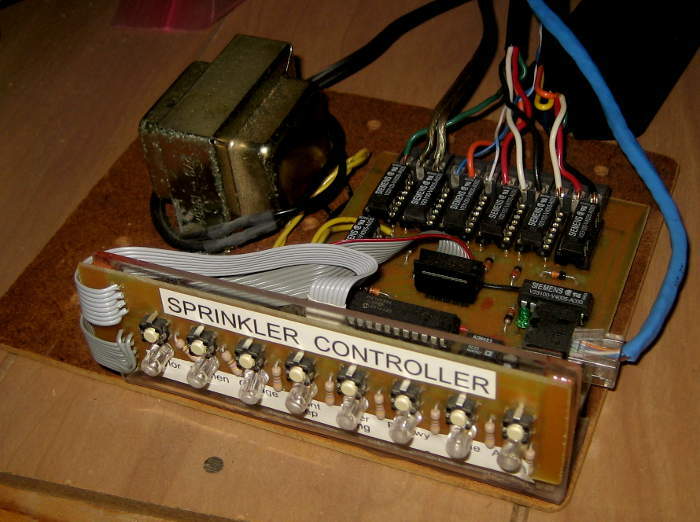 This entry was posted in Home Automation and tagged fountain pump, landscape irrigation, ssr, watering. Bookmark the permalink.